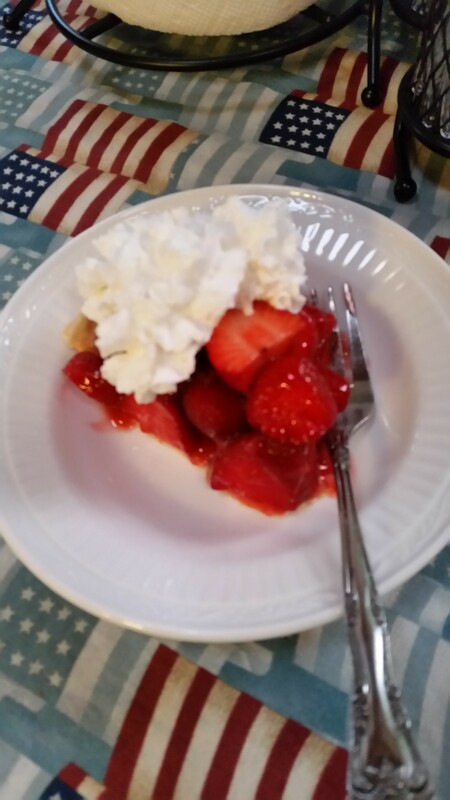 Strawberry pie…as sweet as can be! 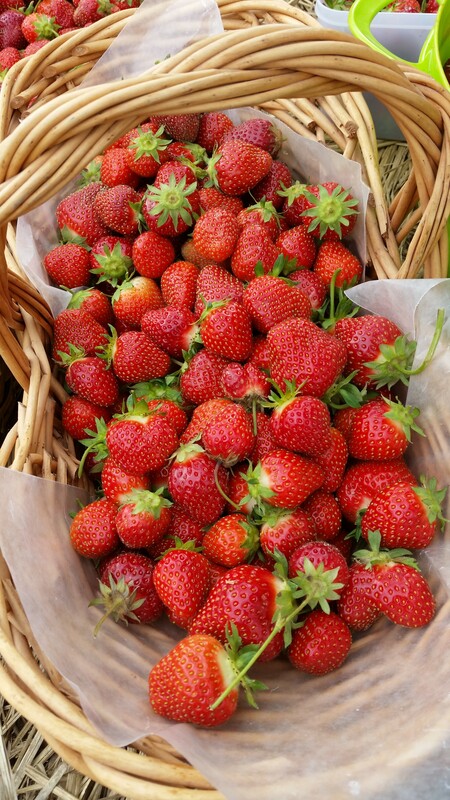 Oh how we love strawberry season! It’s time to pick the juiciest berries that we can find! Do you think we did just that? 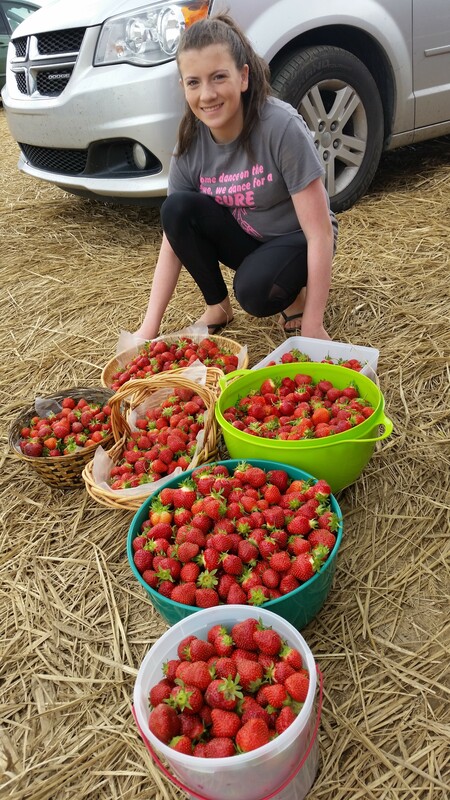 Our sweet girl, Emily, and my sister Maria (her granny), and I went to a little farm to find the best berries we could. This time we were smart and each wore disposable gloves….boy, they made all the difference! Anyway, after about an hour, we had filled our vessels to capacity….here was my personal stash! When we got home, I researched the best way to keep these beauties fresh and long lasting. Well, I found advice from a blog, Momables and I can say it was the best advice ever! Following her instructions below, even today, after 8 days, my strawberries are still fresh and plump like they were just picked! Leave a smidge open on container so they don’t get too much moisture! 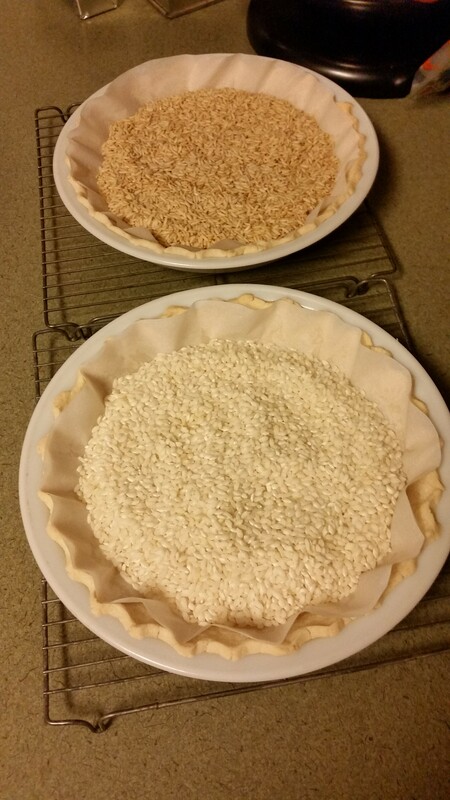 NOTE: I used 9 x 13 glass dishes with paper towels and only covered top layer with paper toweling; stayed perfect! 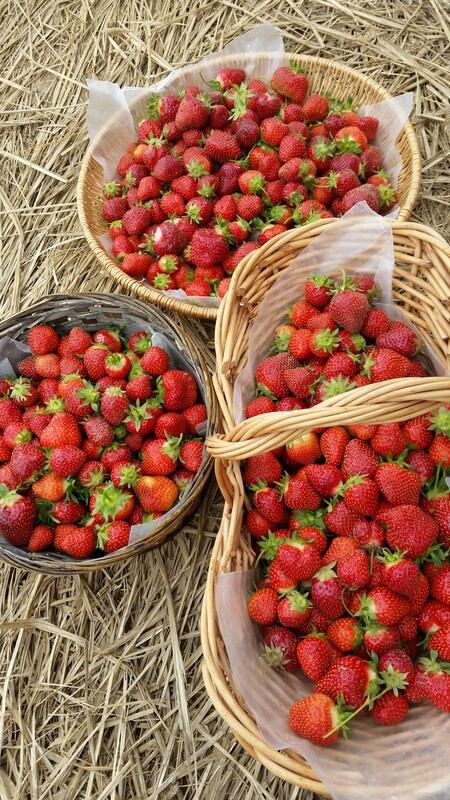 And depending on the amount of strawberries you pick, you may have to do this several times. I also decided to make my own strawberry filling for the pies since I wanted to eliminate some of the sugar content, so I followed this recipe! In a sauce pan, put 1 cup sliced berries, ½ cup sugar, salt, and ¼ cup water. Bring to boil. Cook 3 minutes. Remove from heat. Mix cornstarch and remaining water. Add to sauce pan. Return to heat. Stir until thickened, about 2 minutes. 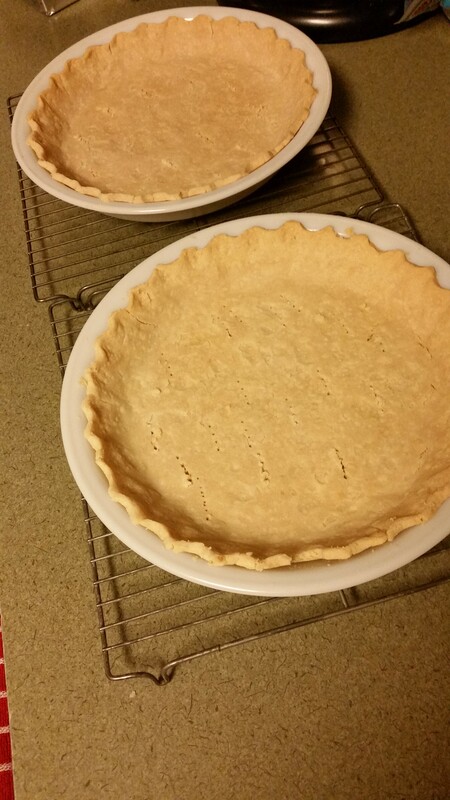 Meanwhile my official pie crust maker and our biggest gluten free lifestyle supporter, my hubby, began to make the crust. We decided to try a gluten free blend and chose King Arthur’s Measure for Measure blend with my mother’s pie crust recipe! Whip shortening and water with a fork until smooth and creamy. Add milk, flour and salt. 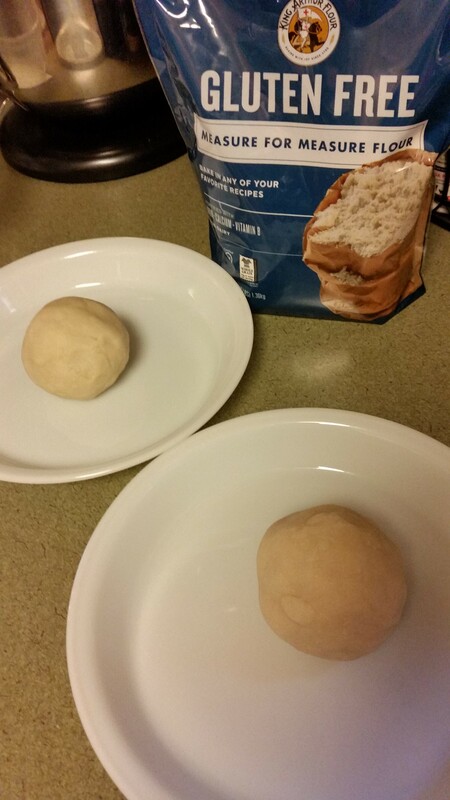 Work into a nice dough ball. for each and filled with uncooked rice. 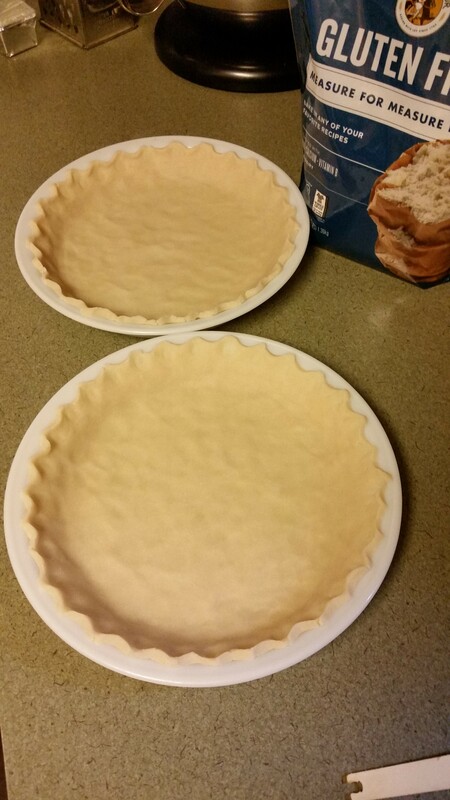 Baked the crusts at 375 degrees for 20 minutes and then took them out of the oven, removed the rice with parchment, and then pricked small tine marks with a fork in the bottom of the crusts. Then I placed the crusts back in the oven for 20 minutes. While letting everything cool (filling and crusts), I removed the stems from the strawberries. 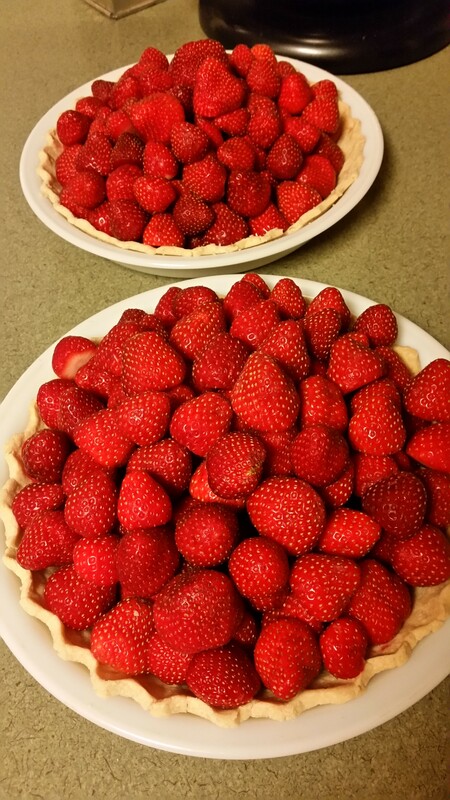 And now the best part…..filling them up with the sweet strawberries! Once I liked the arrangement, I began pouring the filling over the strawberries. It was so thick and lovely! but honestly, that didn’t occur to me. That’s why she’s a pastry chef, and I’m not!! 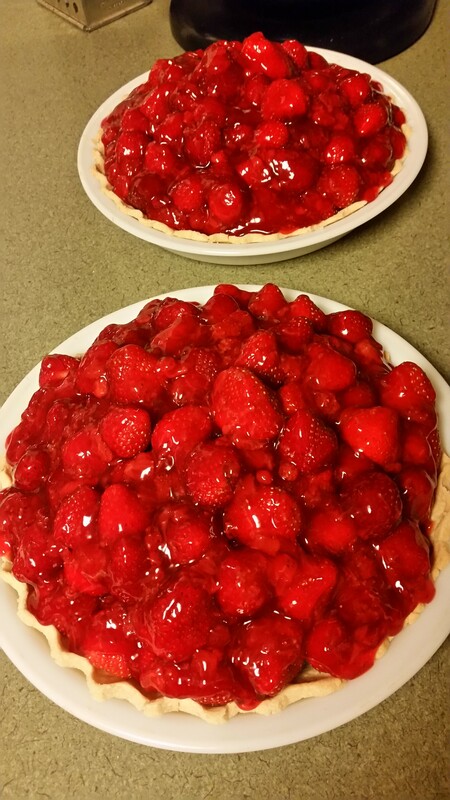 Anyway, here is picture of our completed strawberry pies! And the “pie maker” and “official gluten free taste tester” finally gets to dig in! 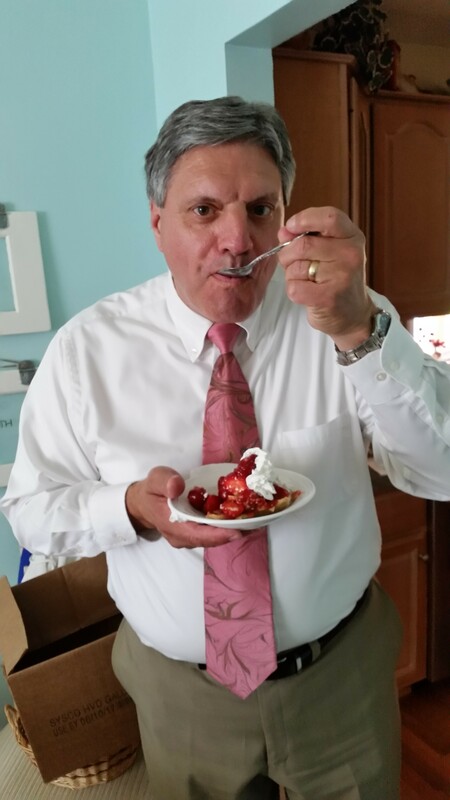 …but most of all, eating strawberry pie! What kind of “double talk” is this? We wanted to name our blog "double talk" to give you, the reader, two different perspectives on living with celiac disease. One from the viewpoint of a mom, and the other from a daughter. Since we were diagnosed at two very different times in our lives, we see things much differently! Join us as we share our experiences! Mmm, mmm, good….gluten free Maine! Chicken and Broccoli Casserole…..gluten free style! What's Katie Up To ? © Monica and Daria and Gluten-free Double Talk, 2018. Unauthorized use and/or duplication of this material, including photographs, without express and written permission from this blog’s authors and /or owners is strictly prohibited. Excerpts and links may be used, provided that full and clear credit is given to Monica and Daria and Gluten-free Double Talk with appropriate and specific direction to the original content. Making Mondays just a little bit brighter.